Lately, I've come across a few instances of children expelled from school for bringing a knife to school. One instance was recounted in the Huffington Post by my colleague the Rev. Meg Riley, whose 17-year-old child, Jie, was almost expelled for bringing a knife to art class. Jie brought a knife to school to use as a tool in the production of art, and disclosed the possession of the knife to the art teacher. In Jie's case, Jie was given an ambiguous decision that was kind-of suspension and kind-of not, thanks in no small part to Meg Riley's advocacy, I'm sure. The other situations I've read or learned about (and the others are all in Michigan) have been more unyielding. Yesterday, at Slate.com, there was the story of Atiya Haynes. Atiya was given a pocket knife with a 3.25-inch blade by her grandfather, for the purpose of protection. Atiya lives in Detroit. She accidentally left it in her purse, where it was found when her purse was spontaneously searched at a school function. Atiya has been expelled for the rest of the school year, her senior year in high school. She is being allowed to take virtual classes and graduate with her class. In a publication of the Student Advocacy Center of Michigan, I read the story of a unnamed teen who had, at the time of writing a year ago, been expelled for bringing a paring knife to school. 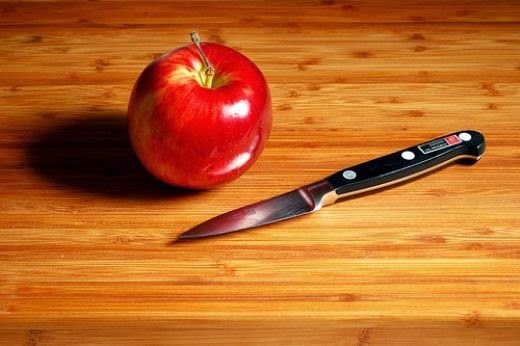 The student brought a knife, without thinking of it as a weapon at all, to cut an apple the student had packed to eat. The student writes, "I was suspended for a year because I like apples." And then there's one case I know of personally, of a student expelled for bringing a kitchen knife to school for self-protection from bullying. This student was expelled for the rest of the year for possession of the knife. In all three cases in Michigan, the students were expelled. In Jie's case, Jie was suspended. And the situations are all very different, but all involve bringing a knife to school. One knife was brought as an art tool, one as a kitchen tool, and two for self-defense. None of the students wanted to hurt someone, and none did hurt anyone with the knives. Our "zero tolerance" policies are creating situations where we look at the knife, and not at the child. Michigan law requires a school to expel the student for carrying a weapon, except if certain conditions are met. None of these children were a threat, and all could be dealt with in other ways, if we had the ability to look at the situation and at the child, instead of feeding the school-to-prison pipeline. When expulsion of a student happens, the whole family is affected. The parent or parents will be thrust into the world of disciplinary hearings and their lives will be in limbo for a while. Then, when the expulsion is finalized, they will try to find another school for their child, usually to be turned away. In Michigan, no other public school can take the child, so the family will have to turn to private schools, which aren't required to take the child, and which can have a hefty price tag. At the end of the day, they are often left to the options of a virtual classroom or home schooling, both of which then require a parent to be home, if the child is under the age of being able to be left at home alone, or to pay to have childcare for the hours the parent works. Kicking a child out of school can imperil a whole family's welfare, as the parent struggles to keep the child educated and fed at the same time. We need to, as a society, rethink "zero tolerance" and "three strikes" laws. We need to rethink them when it comes to our prisons, but we also need to rethink them when it comes to our schools, and we need to stop treating children like criminals. We need to give the schools the ability to look at the situation and look at the individual child, to think about what's best for the school and what's best for the child. In liberal religion, we often talk about how much we value education. It's time for us to recognize that this is a major way in which some children are not getting the same access to education that others are, and work to make a change.